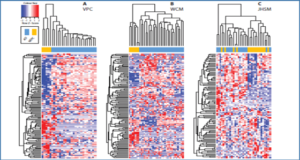 Eukaryotic genomes generate a heterogeneous ensemble of mRNAs and long noncoding RNAs (lncRNAs). 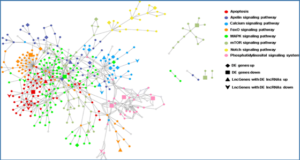 LncRNAs and mRNAs are both transcribed by Pol II and acquire 5′ caps and poly(A) tails, but only mRNAs are translated into proteins. 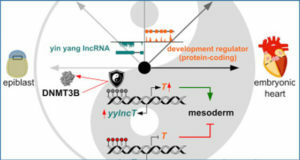 To address how these classes are distinguished, researchers at the Wellcome Trust Centre for Cell Biology, UK identified the transcriptome-wide targets of 13 RNA processing, export, and turnover factors in budding yeast. 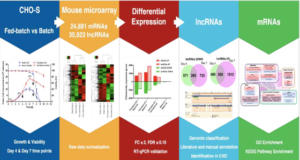 Comparing the maturation pathways of mRNAs and lncRNAs revealed that transcript fate is largely determined during 3′ end formation. 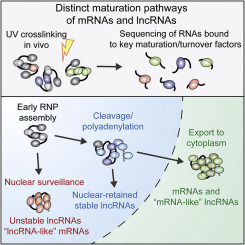 Most lncRNAs are targeted for nuclear RNA surveillance, but a subset with 3′ cleavage and polyadenylation features resembling the mRNA consensus can be exported to the cytoplasm. 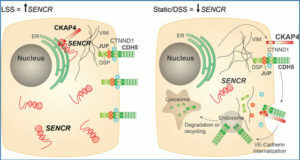 The Hrp1 and Nab2 proteins act at this decision point, with dual roles in mRNA cleavage/polyadenylation and lncRNA surveillance. 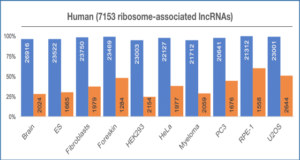 These data also reveal the dynamic and heterogeneous nature of mRNA maturation, and highlight a subset of “lncRNA-like” mRNAs regulated by the nuclear surveillance machinery.